I've wondered what Vanden Plas has been doing since the release of Christ 0 nearly four years ago. The answer is that these German progressive metallers have been quite busy. They been doing their own musicals, Abydos, Ludus Danielis and Christ O (which debuted in Munich in 2008). Vanden Plas was also involved in the production of Jesus Christ Superstar and Hair, among other accomplishments. That's quite the resume. O yeah, they've also left InsideOut and signed with Italy's Frontiers Records for the release of this year's The Seraphic Clockwork. True to form, The Seraphic Clockwork finds Vanden Plas as solid as ever in their progressive heavy metal. Again the work is concept album: The Seraphic Clockwork chronicles a journey in place and time from 16th century Rome to Jerusalem in the year 33 A.D. The protagonist, after an apocalyptic vision, has come under the spell of an Old Testament prophecy and must travel back through the centuries to face his God-given destiny. 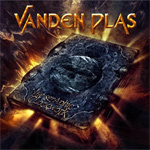 One listen tells you that Vanden Plas has easily combined the drama of their recent theater with the genius of their progressive heavy metal. 'Heavy' and 'dramatic' may be the operative words here. Songs like Scar of an Angel and Sound of Blood have some the most intense moments of any Vanden Plas song, rolling like the thunder amidst the intricacy of the arrangements. These arrangements provide the drama propelling each song with cunning and entertaining diversity that will intrigue the careful listener. The aforementioned tracks make this evident as does enigmatic Rush of Silence, but the real thrills are left to the epic and stirring On My Way to Jerusalem. Some prog purists might note the sometimes extra amounts of power metal influences that fill some moments, and this may put them off. But the breadth and depth of the whole easily allows the listener to endure this. Nevertheless, The Seraphic Clockwork is Vanden Plas at their best. On display is their fine musicianship, but it's in their compositional skills where they have truly excelled. Very recommended! The Seraphic Clockwork is Vanden Plas at their best with their most intricate, heavy, and entertaining compositions to date.